Ecommerce is great for three reasons – convenience, free shipping and savings. The third one, in my opinion, is something that is under utilized by many consumers. Hence, I thought it would be a good idea to show on how to use Topcashback to save on your purchase while making some extra money. If you’re always shopping online, this is one legit opportunity not to be missed. Established in 2011, TopCashback partners with over 4,000 online stores, ranging from small, medium to big size brands, to offer a wide range of discounts in the form of cashback and coupon codes. In the US, it is known as the most generous rebates site because the commission is passed on to the consumers as 100% cash back. This is made possible because the company is supported by advertisements, sponsored listings as well as the bonuses they receive for driving traffic to the merchants’ stores. Cashback and bonus payouts can be received through direct deposit to bank accounts, PayPal, American Express, or in the form of gift certificates. There’s no minimum payout threshold and you can choose to be paid at whatever time frame. You can also stack cashback and coupon codes to get more savings. The site will feature cashback offers during major shopping seasons such as Black Friday, Cyber Monday and Green Monday. So it is worth signing up for their newsletter notification. However, a user account must be signed in at least every 6 months to prevent it from being marked as ‘dormant’. Just like a big retail store, TopCashback offers a variety of departments from home & gardens to office & businesses. Petco, Amazon, Walmart and Bonanza marketplace are some of the familiar names that you can find in the merchant list. 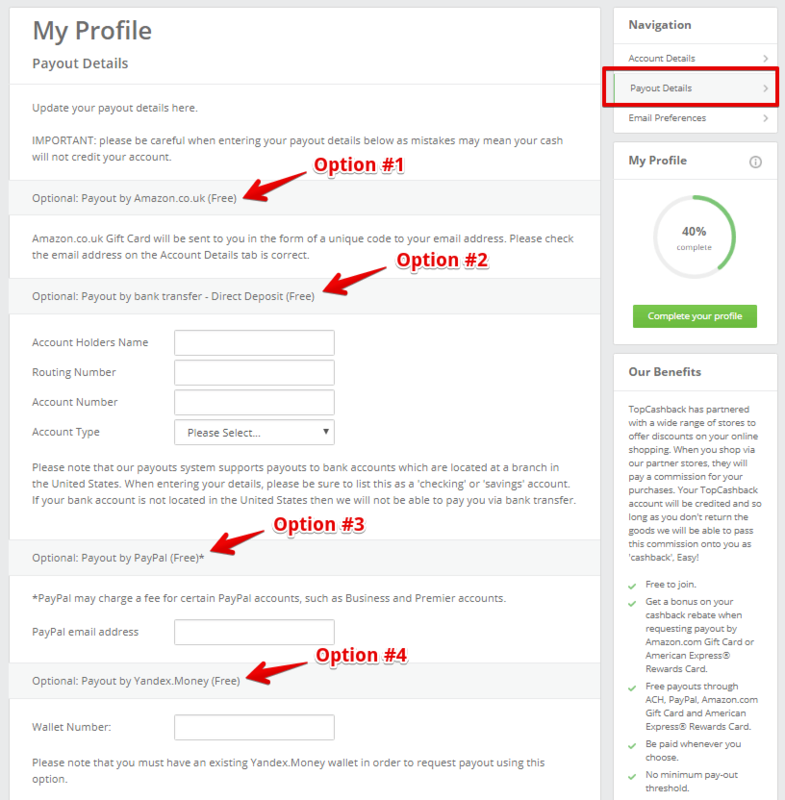 To earn from cashback, you need to create a user account and under the profile payout page, select the payout method you would like to use. After that, start shopping by selecting the merchant that you want to buy from. You can search for merchants in the directory, according to the departments or via exclusive offers that are published on the site. Either way, always make sure that you click on the merchants through the rebate site and enable the cookie feature on the PC for tracking purposes. Cashback is earned in the form of percentage from the sale of an item and it could range anywhere between 1.5% to 20%. That means, if the offer is at 10% and the product sells for $100, the cashback is worth $10. If tracking process is in proper order, the cashback is usually payable within 7 days of purchase after which it can be withdrawn. If you think friends and family can benefit from rebates such as this one, then you should consider joining their referral program. It’s basically a cash reward system that pays $15 upon the referred members earning $10 cash back with no time restrictions. This offer is in fact better than the Ebates program because the latter only pays $5 upon the referred member spending $25+ and earning cash back within 1 year. The first option is to paste the link as it is in a message to a friend. Or use the template provided by the site to send out emails to the recipients. Thirdly, you can also share on Twitter or Facebook to let people sign up via social media postings. Therefore, if you have 10 friends who shop through TopCashback, you could potentially earn a total of $150 from the referrals. Realistically speaking, there are only so many friends and families that you can pass the word around. At some point, this number is going to plateau, which begs the question – is it possible to promote this program to people that you don’t know? The simple answer is yes, but it will require a bit of online marketing, specifically affiliate marketing. The latter is basically an income model that allows you to monetize from promoting a certain product or service online. So in this case, you will be referring new users to the offers on TopCashback site. The advantage of becoming an affiliate is that it is a form of online business that can be profitable if committed for the long term. One can also partner with several merchants, hence adding more income streams. That means, you can talk about TopCashback as well as other rebate sites that have referral programs. The first step to get started with affiliate marketing is to create a website that targets savvy shoppers. You need to know who they are, what are their shopping behaviors like and what type of offers would most likely interest them. A popular example you may have seen is a mom blog that often uses cashback techniques to discuss about stretching the household budget. Firstly, find a domain (name of a website) that best reflects the niche or group of audience that you want to engage with. A .com usually cost you less than $15 per year. Next, connect the domain to the WordPress platform via a website hosting service. Use one that offers one-click installation – it’s so much easier. Inside your WordPress dashboard, select a theme (design layout) that you like, activate it and launch the site. It’s that easy. The next thing to do is to write about your experience using TopCashback and turn it into a review. Share as much detail as you can from the perspective of a user, show people what are the benefits and how they too can sign up for the program through your unique referral code. So unlike referring friends and family through a short email, a review format encompasses more information that can potentially convince readers to sign up as users. But one review page is not enough because in order to attract online traffic (aka visitors) and sustain at that, you need content – lots of them. That’s why we build a WordPress website in the first place as it is such a great software to organize and publish articles for any type of business niche. Finding what type of content to write has a lot to do with understanding keyword research and using the right keyword tool. Imagine if you know what type of queries people are using to search for cashback tips online – these are all valuable keywords that you can leverage from to generate traffic through well-structured content. If you like to know how to discover profitable keywords for this niche, read more about the topic on this page. Ready to Earn Some Extra Money Online? Over the past few years, customers have been paid hundreds of million of dollars in cash back so imagine the amount of savings an individual can make through this method. Likewise, as online shopping trends continue to grow, there’s only going to be more opportunity to reach the different segments of audience that are out there. Now that you know how to use TopCashback, which route will you take to earn that extra cash? With friends and families, it’s easy, but opportunity is limiting. With affiliate marketing, you can do so much more, including starting an online business. That’s something to ponder. Well, I do hope that you’ve found some values from this piece of information. If you have the slightest interest to learn more about making money online, please check out my recommended training platform for more details. Alternatively, if you have any thoughts or questions in regards to rebate sites, just leave them in the space below and I’ll get back to you as soon. I have been using TopCashback for a while now, it just makes sense to shop a little smarter and earn cashback on things you were already going to buy. It surprised me how many retailers were actually signed up for it too. Great way to save up for Christmas shopping I would say. The thing I often wonder about cashback services (as I myself don’t use one yet) is the selection of participating stores. By this I mean, where do you shop to gain the cashback and what prices are you paying in the first place? I’m under the impression that you are paying high prices for items you could get cheaper elsewhere – would I be right in thinking that TopCashback is like this? No, it’s not like that Chris. A cashback site partners with various online stores to promote discounted prices for consumers who shop through the cashback site. It’s actually an affiliation partnership between the two companies. When they refer you to shop on a certain place, the merchant will pay some commissions to the cashback site. This commission is then split between you and site like TopCashback. In any case, you aren’t paying higher prices for the items. I hope this makes sense. And now, I have TopCashBack as part of my plan too! It’s awesome to be able to help others save and get paid for it. Thanks for introducing me to this wonderful program. Thanks for the interesting article. I am always looking for ways to earn extra income (legally of course). It is quite difficult to find the genuine needles in the scam haystack. It seems as though there are are a lot of people who will try and part you with your money and some of them do it “legally” like tax or medical bills. TopCashback sounds pretty straightforward though. I also like the multiple payout options they provide.